The time to express your deepest love and affections to that special someone is quickly approaching. Valentine's Day is just a short distance away. Whether you already have something in mind, or need some inspiration, below are some of our best Valentine's gift ideas for her. This thorough list is here to guide you in the right direction. Below are some of the top Valentine's Day flower ideas, chocolate gifts, plush stuffed animals and more. Red roses are the traditional Valentine’s Day flower, so why not express your love with this beautiful bouquet of 12 long-stemmed red roses? A dozen roses are placed with seeded eucalyptus and hand-arranged to ensure a gift to her heart from yours. The bouquet comes in a tall glass vase and is available for same-day delivery to her home or workplace. It's one of our most recommended and popular Valentines gifts. If you’re looking for a bouquet with more than roses, then look no further than this charming Delightfully Pink bouquet featuring pink roses, white Asiatic lilies, pink waxflower and white Monte Casino blooms. The bouquet has a fun and flirty look and is hand-arranged in a pink fluted vase complete with a cute polka dot ribbon. Measuring 14"H by 11"L, this bouquet lets you show how much you care in a beautiful way. 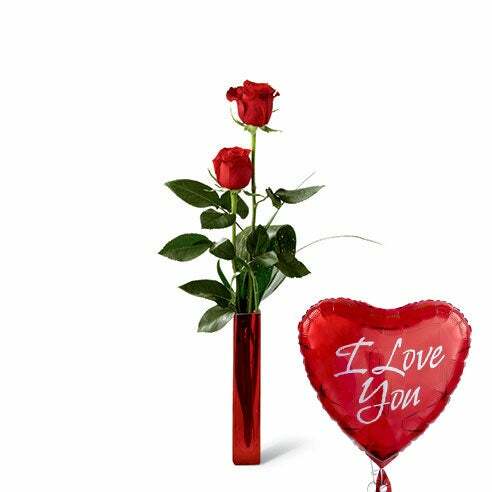 Whether you are looking for something in addition to a bouquet purchased or as a gift on its own, these six “I Love You” Mylar balloons are a fun, playful way to express your devotion. The balloons are tied together by a ribbon and can be delivered same-day so you can surprise your sweetie and bring a smile to her face with these bright, shiny balloons. Everybody needs a hug now and then, and this bouquet, featuring a 6-inch bear hugging a ceramic vase, is the perfect way to indulge your special someone. Lavender Peruvian lilies, magenta mini carnations and lush greens come together to create a flawless expression of love, gratitude and cheer, making this an unforgettable gift. The Big Hug Bouquet is the right amount of balance between beauty and cuteness for your Valentine. 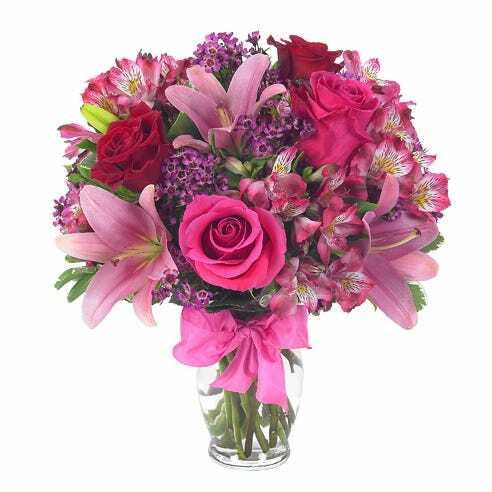 The Rose and Lily Delight brings a flirty and spectacular combination of pink and red flowers that will make for an unforgettable gift for any recipient. This colorful array of flowers includes pink and red roses, pink Asiatic lilies, pink Alstroemeria, and waxflower creating an alluring, romantic look. 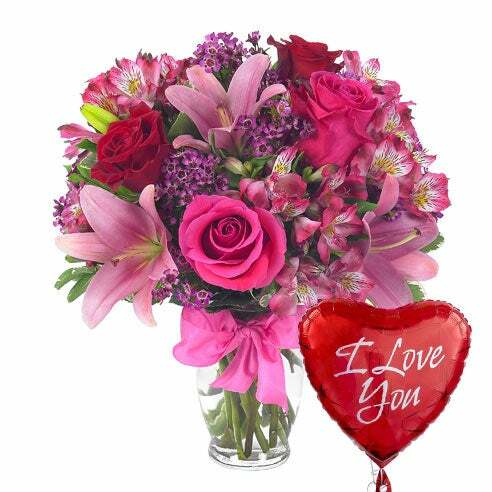 This delightful bouquet comes in a clear fluted vase with a pink ribbon and is sure to warm the heart of your Valentine. The hugs and kisses red rose and white daisy bouquet has a southern sweetness to it. They're hand-arranged in a glass red vase and finished with a polka dot ribbon for that added touch of cuteness. Surprise her this year by showing your charming side. Send her a giant teddy bear delivery for Valentine's Day! She'll love it's soft texture and it's nice that it will last such a long time! This cuddly plush stuffed animal is hand-delivered with a smile straight to their door. Cute and soft, she will think of you every time she hugs it. Best of all this stuffed animal delivery will last a very long time! A gift basket of sweet and salty snacks would be great for Valentine's Day delivery! With mixed chocolate bars and salty snacks, it's fun to mic a match indulgences. Topped with a big red bow, it fits the Valentine Day theme. It's so delicious and jam packed full of goodies, she may even share with you. Choose at the checkout how grandiose you want your Valentine gift basket for her to be. Pick between 12, 18, or 24 red roses in this romantic mixed bouquet. With a red curving and wave carved vase, it's every bit the epitome of romance this Valentine's Day. Hand-arranged within mixed fern greens, it's full bodied and lush. When she receives a full bodied red rose delivery from you, she's definitely going to be impressed! There's giving someone Valentines Day chocolate, and then really giving someone Valentine's Day chocolate. To impress her this holiday, send a chocolate gifts basket with luxury candy like Godiva and Ghirardelli specials to make her mouth water. Decadent and equally delicious, this mixed luxury chocolate basket is the best way to win her heart. Straight from the stomach directly to the heart, as they say. A beautiful and inexpensive bouquet of daisies and red carnations, this floral arrangement is ideal. Available for same day Valentine's Day flower delivery, you can send a cheap bouquet that's still beautiful. With mixed greens and small touches of petite white flowers, it's cute, just like her! With a beauty gift basket for her, she can relax at home with some great house slippers and body treatments. She can pick when to have her much needed "me time". She can relax in the evening after work, or she can pick a saturday to start her morning with a great bath. With the fragrant aroma of cherry blossoms filling the air, she's sure to feel transported to a relaxing place, even if only mentally! There are so many reasons to send a Valentine's Day candy gift basket. This is one of the best cheap valentine baskets you can send. It has several popular candies and snacks for them to choose from, and at a low price too! Maybe money is tight this year, or perhaps she likes sweets but won't enjoy having hundreds fo them! Whatever your reason may be, this is an ever popular Valentine gift basket for her! We hope you didn't miss our statistics on the flowers womens like most! If you read it then you already know that pink roses were the winner! These boxed long stem pink roses are one of our favorites. Beautifully packaged, opening one up feel like receiving a wrapped present. Send these long stemmed pink roses in a box, and treat her to an exquisite experience. If you like the idea of packaged flowers but aren't feeling a boxed bouquet, consider paper wrapped flowers. This kind of bouquet is perfect for someone who already has a vase at home or wants to be nice to the planet. Finished with a red curly ribbon, this hand held red rose bouquet is farm fresh and simply dreamy. Send a spa Valentine's Day gift for her with bath bombs, shower gel, a loofah and more. She can relax and take it easier this holiday. No matter what she has on her plate, a relaxing soak in the tub can always help to clear stress away. This white lily bouquet with red roses is romance personified. Hand delivered in a glass vase she'll love the clean feeling it emits with its fresh white flowers. This same day deliverable Valentine gift is sure to make her gasp and sigh all at once. For the random woman who doesn't want flowers! Hey, we haven't met her, but maybe she does exist. For those of you looking for something that's just fun, send 12 floating latex balloons and a squishy teddy bear. A balloon bouquet and delivered teddy bear is colorful, larger than life and leaves her with a long lasting gift. Sending balloons is always fun and an instant pick-me-up for the recipient. Everyone loves roses, but for something different, why not send tulips Valentines Day? This mixed and affordable rainbow tulip bouquet is sure to spark her interest. One great thing about this mixed rainbow tulip bouquet, other than its beauty, is how long lasting the flowers are. Tulips live for a longer time than roses in many cases. For a longer lasting Valentine flower bouquet, choose the tulip arrangements! This particular style comes delivered in a beautiful box arrangement. The Sweetest Heart rose bouquet is a same-day Valentine's Day flower delivery favorite. This smaller rose bouquet maintains a low price point while still looking full bodied. With a few touches of scattered roses and smaller mini roses, it's very inexpensive while still looking grandiose. Imagine her surprise to open the door to an arm full of long stem pink roses and Godiva chocolate delivery! She couldn't be happier. You'll fulfill her need for beauty and satisfy her well-deserving taste buds too. Remember pink roses are the most sold Valentine's Day flower at Send Flowers, so don't shy away from ordering pink if you prefer it to traditional red flowers. If you're still determined to send red roses then there's no reason that you shouldn't! Here's the same beautiful rose bouquet with Godiva chocolates but in that ever popular color bright red. Pick between sending a small, medium, or large version with 12, 18, or 24 red roses. When flowers don't tickle your fancy and you're not feeling the chocolate gift baskets, we suggest a brownie gift box instead! Adorably packaged in a golden box with a pretty ribbon, they're lovely and delicious. It's a variety pack, so there are many different flavors that she can enjoy at her own pace. Another beautiful boxed roses arrangement, this hand-delivered gift is colorful and packed full of fragrance. Bright mixed long stem roses blend together in an exhibition of color in this delivery. She'll love opening the box for a luxury experience and she can use a vase she already has at home to house the flowers. For the love of your life, we have this giant rose bouquet delivery. Sure to delight, shock, and romance her, this huge rose bouquet clearly says I love you. Whether you're newly weds or you've been together for 25 years or more, this gift goes above and beyond. She will know without a doubt that she's adored. This I love you balloon bouquet and teddy bear arrangement is every bit as fun as she is! The best part may be having the teddy bear long after balloons or flowers are gone. The mylar balloons included in this Valentine gift delivery will last quite a few days, but it's always nice to have something to hold onto. Cuddly, and ever sweet she'll think loving of you every time she squeezes it. Use free Valentine gift delivery code DELVFREE and enjoy a great discount when you send her flowers, chocolates, bears, or balloons. Be sure to check out the rest of our Valentine's Day Gifts Collection to find the perfect way to show your adoration for your sweetheart.